Convicts, pirates, mutiny -- this book has it all. Gaolbird is the true story of a man named William Walker, who was convicted of burglary and transported to Van Diemen's Land in 1821. William earned himself a reputation as an escape artist, eluding authorities for the first time when he jumped overboard in the North Sea. He eventually changed his name to William Swallow, a humourous tribute to the bird of the same name known for long flights, and his escapist antics caused havoc. In his most famous episode, William stole a ship called the Cyprus, complete with its full load of tobacco and alcohol, sending the crew overboard. William and his fellow convicts then set off in the opposite direction, but all did not go to plan (if there was a plan). There were fights, desertions, and a battle at sea before the ship had to be abandoned. Changing his name again, William made his way back home to England, but was ultimately captured again, and transported again. He was worked hard, died a captive in the penal colony, and buried in an unmarked grave. Gaolbird is such a crazy story, it's difficult to believe it's true, but it is. William Walker/Swallow had his name and life 'immortalised' in convict records and other historical documents, and in a play, stories and the lyrics of a song (The Ballad of the Cyprus). 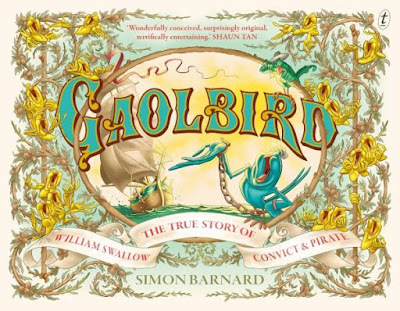 William's isn't the only story told in Gaolbird, though. We also get to follow a sailor in the Royal Navy who deserted and was himself transported. His name is only ever given as Popjoy, and like William, Popjoy also tried to escape the authorities more than once. Popjoy's path crosses with William's when they are both aboard the Cyprus. Author and illustrator, Simon Barnard has a strong interest in the history of his Tasmanian homeland, and has created a unusual book inspired by the truth being stranger than fiction. He has used birds to depict his central characters (with a swallow for William Swallow and a parrot for Popjoy), something that adds even more character to people who are already quite larger than life. The illustrations are in a crisp, cartoon-style, and full of detail. Gaolbird is accessible reading and in a style that would be appealing to today's young readers who watch televison and movies. There is a real sense of humour in the story, which could be described as both farcical and tragic. It is certainly memorable.